We saw in §5.4.1 that our ability to resolve two closely spaced sinusoids is determined by the main-lobe width of the window transform we are using. We will now study this relationship in more detail. For starters, let's define main-lobe bandwidth very simply (and somewhat crudely) as the distance between the first zero-crossings on either side of the main lobe, as shown in Fig.5.10 for a rectangular-window transform. Let denote this width in Hz. In normalized radian frequency units, as used in the frequency axis of Fig.5.10, Hz translates to radians per sample, where denotes the sampling rate in Hz. Figure 5.10: Window transform with main-lobe width marked. as can be seen in Fig.5.10. As Fig.5.10 illustrates, the rectangular-window transform main-lobe width is radians per sample (two side-lobe widths). Table 5.1 lists the main-lobe widths for a variety of window types (which are defined and discussed further in Chapter 3). Table 5.1: Main-lobe bandwidth for various windows. A practical engineering definition of main-lobe width is the minimum distance about the center such that the window-transform magnitude does not exceed the specified side-lobe level anywhere outside this interval. Such a definition always gives a smaller main-lobe width than does a definition based on zero crossings. 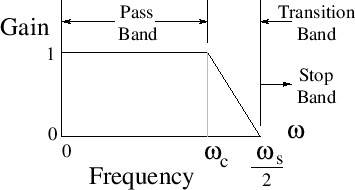 Figure 5.11: Lowpass filter design parameters. In filter-design terminology, regarding the window as an FIR filter and its transform as a lowpass-filter frequency response , as depicted in Fig.5.11, we can say that the side lobes are everything in the stop band, while the main lobe is everything in the pass band plus the transition band of the frequency response. The pass band may be defined as some small interval about the midpoint of the main lobe. The wider the interval chosen, the larger the ``ripple'' in the pass band. The pass band can even be regarded as having zero width, in which case the main lobe consists entirely of transition band. This formulation is quite useful when designing customized windows by means of FIR filter design software, such as in Matlab or Octave (see §4.5.1, §4.10, and §3.13). 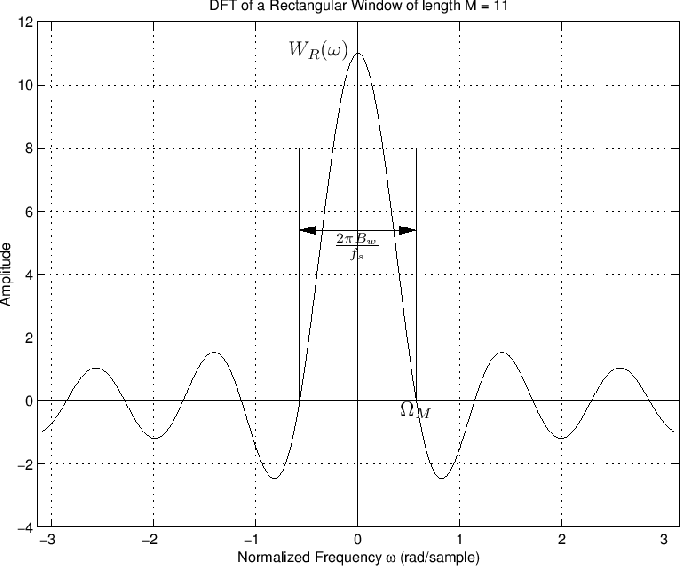 Recall from §5.4 that the frequency-domain image of a sinusoid ``through a window'' is the window transform scaled by the sinusoid's amplitude and shifted so that the main lobe is centered about the sinusoid's frequency. A spectrum analysis of two sinusoids summed together is therefore, by linearity of the Fourier transform, the sum of two overlapping window transforms, as shown in Fig.5.12 for the rectangular window. A simple sufficient requirement for resolving two sinusoidal peaks spaced Hz apart is to choose a window length long enough so that the main lobes are clearly separated when the sinusoidal frequencies are separated by Hz. For example, we may require that the main lobes of any Blackman-Harris window meet at the first zero crossings in the worst case (narrowest frequency separation); this is shown in Fig.5.12 for the rectangular-window. Figure: Two length- -rectangular-window transforms displaced by rad/sample. To obtain the separation shown in Fig.5.12, we must have Hz, where is the main-lobe width in Hz, and is the minimum sinusoidal frequency separation in Hz. For members of the -term Blackman-Harris window family, can be expressed as , as indicated by Table 5.1. In normalized radian frequency units, i.e., radians per sample, we have . For comparison, Table 5.2 lists minimum effective values of for each window (denoted ) given by an empirically verified sharper lower bound on the value needed for accurate peak-frequency measurement , as discussed further in §5.5.4 below. Table: Main-lobe width-in-bins for various windows. Thus, to resolve the frequencies and , the window length must span at least periods of the difference frequency , measured in samples, where is the effective width of the main lobe in side-lobe widths . Let denote the difference-frequency period in samples, rounded up to the nearest integer. Then an `` -term'' Blackman-Harris window of length samples may be said to resolve the sinusoidal frequencies and . Using Table 5.2, the minimum resolving window length can be determined using the sharper bound as . 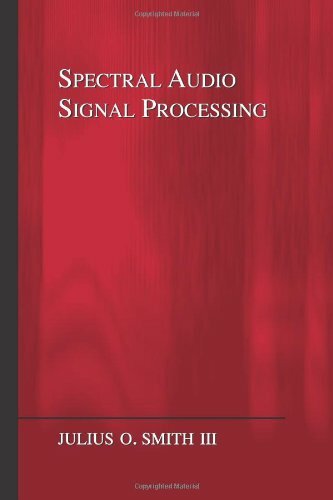 Note that is the fundamental period of the signal in samples. Thus, another way of stating our simple, sufficient resolution requirement on window length , for periodic signals with period samples, is , where is the main-lobe width in bins (when critically sampled) given in Table 5.2. Chapter 3 discusses other window types and their characteristics. and so on, according to the simple, sufficient criterion of separating the main lobes out to their first zero-crossings. These different lengths can all be regarded as the same ``effective length'' (two periods) for each window type. Thus, for example, when the Blackman window is 6 periods long, its effective length is only 2 periods, as illustrated in Figures 5.13(a) through 5.13(c). 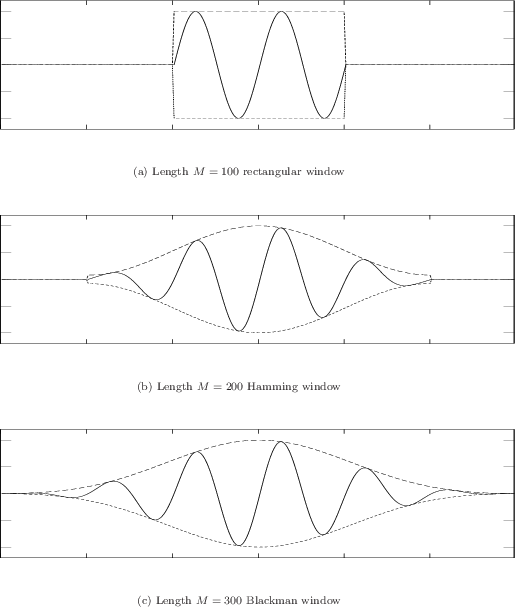 Figure 5.13: Three different window types applied to the same sinusoidal signal, where the window lengths were chosen to provide approximately the same ``resolving power'' for two sinusoids closely spaced in frequency. The nominal effective length in all cases is two sinusoidal periods. 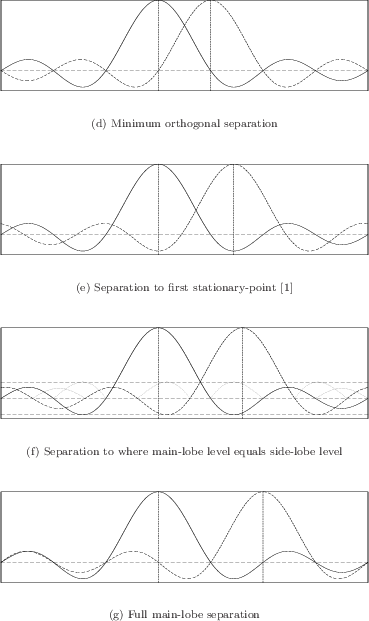 Figures 5.14(a) through 5.14(d) show four possible definitions of main-lobe separation that could be considered for purposes of resolving closely spaced sinusoidal peaks. Figure 5.14: Four alternative main-lobe displacement rules for resolving closely spaced sinusoidal peaks. For peak-frequency measurements based on a few samples at the main-lobe center, (a) is suboptimal, (b) is nearly optimal , (c) is analogous to a filter-design specification based on side-lobe level, and (d) is overly conservative, but sufficient and simple to compute for Blackman-Harris windows. Figure 5.14(b) shows the ``zero-error stationary point'' frequency spacing. In this case, the main-lobe peak of one sits atop the first local minimum from the main-lobe of the other . Since the derivative of both functions is zero at both peak frequencies at this spacing, the peaks do not ``sit on a slope'' which would cause the peak locations to be biased away from the sinusoidal frequencies. We may say that peak-frequency estimates based on samples about the peak will be unbiased, to first order, at this spacing. This minimum spacing, which is easy to compute for Blackman-Harris windows, turns out to be very close to the optimal minimum spacing . Figure 5.14(c) shows the minimum frequency spacing which naturally matches side-lobe level. That is, the main lobes are pulled apart until the main-lobe level equals the worst-case side-lobe level. This spacing is usually not easy to compute, and it is best matched with the Chebyshev window (see §3.10). Note that it is just a little wider than the stationary-point spacing discussed in the previous paragraph. For ease of comparison, Fig.5.14(d) shows once again the simple, sufficient rule (''full main-lobe separation'') discussed in §5.5.2 above. While overly conservative, it is easily computed for many window types (any window with a known main-lobe width), and so it remains a useful rule-of-thumb for determining minimum window length given the minimum expected frequency spacing. A table of minimum window lengths for the Kaiser window, as a function of frequency spacing, is given in §3.9. 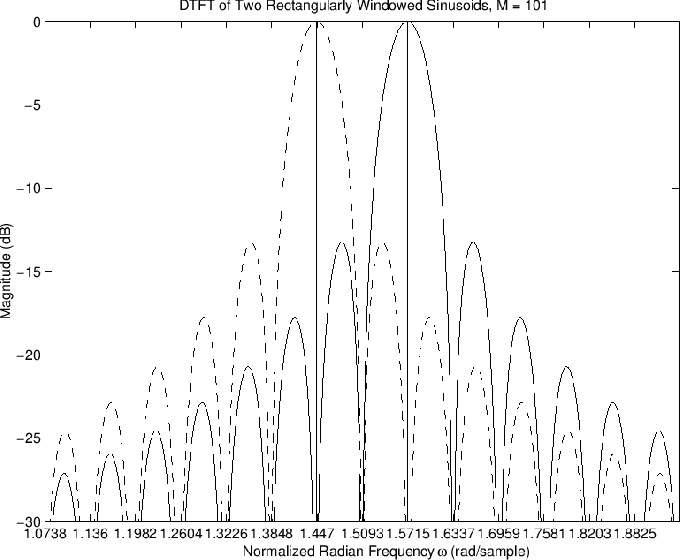 We see that when measuring sinusoidal peaks, it is important to know the minimum frequency separation of the peaks, and to choose an FFT window which is long enough to resolve the peaks accurately. Generally speaking, the window must ``see'' at least 1.5 cycles of the minimum difference frequency. The rectangular window ``sees'' its full length. Other windows, which are all tapered in some way (Chapter 3), see an effective duration less than the window length in samples. Further details regarding theoretical and empirical estimates are given in .